Crescent Industries has been offering in-house tooling solutions for over 70+ years with specialization in building new tooling along with comprehensive maintenance, repairs, and revisions of existing tools to ensure the life of our customers tools. Our journeymen mold builders produce injection molds that provide cavity-to-cavity consistency and repeatability by utilizing high-speed CNC mills, die-sink EDM, and wire-sink EDM. From a simple prototype tool to fully hardened production tools, we match the demand of your product to ensure that your tool will always perform with minimal wear and tear. We have invested in an extensive inventory of master mold bases. These frames have interchangeable inserts which allow for quicker and less expensive mold designs. We make these mold frames available to house your unit molds and tool sets when your molded product is compatible with this type of tooling. This saves you thousands of dollars in tooling costs. Once a mold has run a set number of cycles; inspections, maintenance and cleaning should be performed. Different types of molds age at different rates, so scheduling maintenance needs to be documented carefully. Our knowledge and experience gives us the ability to determine the best mold maintenance schedule specific to each injection mold. Injection mold repairs can be costly. This means it is critically important for injection molds to receive regular maintenance; this is simply the best way to protect your investment and maintain consistent production of quality plastic components. With our on-site tooling facility we provide quick and efficient mold repairs or revisions. Sometimes it’s a necessary but difficult decision to transfer your injection molds to another vendor to run production. We want to make this transition as easy and hassle-free as possible. We follow a documented tool transfer procedure which includes all the steps taken to ensure a smooth tool transfer and limit the loss of production time. In addition, our Project Management Office (PMO) delivers a streamlined process and the security of working with a team of professionals that examine the entire scope of your project. Our Project Managers work closely with you throughout the entire transfer process including the hand-off to our manufacturing team for full production. 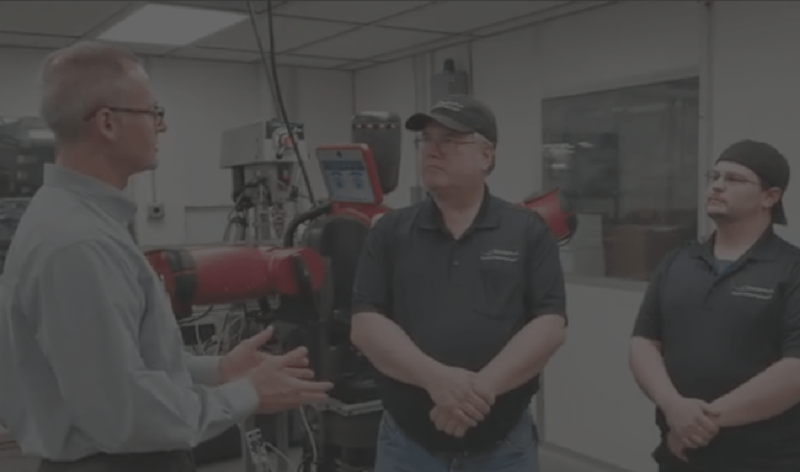 Crescent Industries utilizes CNC automated equipment and highly skilled journeymen and machinists to produce custom and complex precision components. Our equipment includes several horizontal and vertical CNC machining centers, Die-Sink EDM’s, Wire EDM and a 3 Axis/2Axis machining center with a rotary table and capabilities for tombstones and automatic tool changer which achieves extended machining hours and continuous operation. We have invested in CMMs which are located in our tooling facility to perform quality inspections during the machining process to verify precision and accuracy. Injection mold building, maintenance, repair, and modifications requires a combination of technology, equipment, and highly-skilled mold builders to produce injection molds faster with nearly limitless geometry for the plastic components. We offer various solutions for your tooling needs. Our experience has taught us how to build and maintain the highest quality molds to ensure the production of the highest quality components. Over molding has developed into a rather standard process in the field of injection molding. We all enjoy the lightweight, durability, look and feel of modern plastics. Over molding is basically the process of injection molding two different plastics, one on top of or around the other. This results in a single structure that is strong and rigid on the inside yet flexible, colorful and easy to hold on the outside. The variety of textures also makes over molded products more comfortable and easy to use, ultimately providing more personalized products. This process helps to contribute to safety by making components shock absorbent and covers potentially harmful corners and edges. The best way to produce over-molded plastic components is with a vertical/vertical injection molding machine. As it relies on the gentle force of gravity to clamp the inner and outer parts together. The advantage of Family-Molding is that the tooling costs decrease and part prices become lower verses a single-cavity tool. However, family tools can be challenging & difficult due to the natural imbalance of material flow in the cavities. Our Engineers have mastered this process ensuring optimal results. This molding process produces a set of various shaped components molded at the same time and are manufactured from the same material. These injection molds are often ran to produce parts in a set at the same time, individually or in groupings. We utilize mold-fill simulation to learn how parts will fill in the mold to prevent potential problems in the design phase before the tool is actually built. Crescent utilizes sequential valve gating in order to improve performance, reduce variation, and improve balance during the injection molding process.